It’s time for another update on the writing site known as Inquisitr. 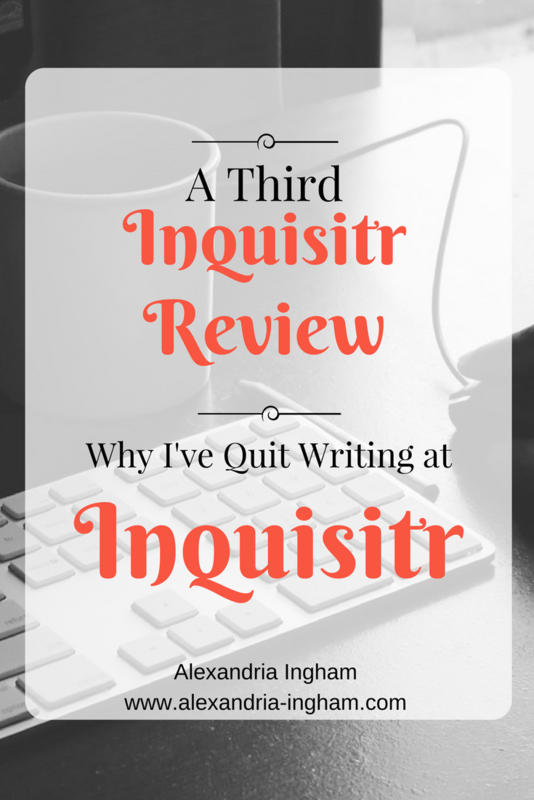 While I could have put in a quick update on my last Inquisitr review, I’ve decided to make another post. Why? Well, this is a big one. You should be able to tell that from the title. 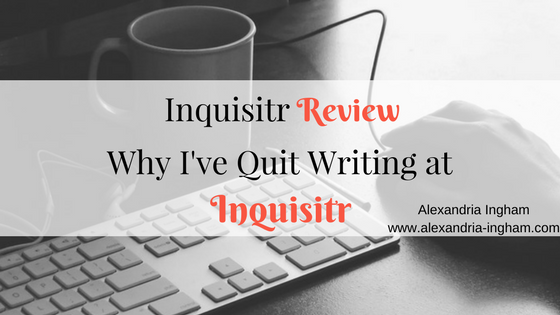 I’ve quit writing at Inquisitr. I unofficially stepped back just before Christmas but made it official this week. I’m sure there are plenty of people wondering why. Inquisitr Review: A News Site That Pays! Sadly it is the income. It’s not worth the return on the investment anymore. Surprisingly enough, a site that pays $1 per 1,000 views (Hidden Remote) is netted me 300% more than Inquisitr, which works out to be about $5 per 1,000 views. I can’t even understand why this is. Well, okay, I put more effort into the other site. But looking back over the last few months (in fact since the change to the payment system has come in), Hidden Remote has continually made me at least 100% more than Inquisitr. And that’s with similar amount of effort in the beginning. In fact, there was a month where I wrote 8 articles for Hidden Remote and 12 for Inquisitr and I made $100+ more on Hidden Remote. It just didn’t make sense to me and was actually really demotivating. The final straw came at the end of December 2017. I went two weeks where I wasn’t even making enough to payout. And Inquisitr doesn’t roll your points over. So if you only get 1 point ($5), that doesn’t roll over to the next week. So two weeks of just 1 point per week meant nothing at all, whereas with a rollover policy it would have been $10. Needless to say, I wasn’t impressed. So I just refused to write anything the next two weeks. I don’t have the time to create content for nothing. Nor do I need to. The Inquisitr isn’t exactly a site I used for my resume. There are plenty of other sites that I use for that, because they’re more in the style of articles and blog posts other Entertainment sites want and I’m more comfortable writing them. On top of that, the Inquisitr forced changes on Facebook pages, Twitter feeds and more. They wanted a “professional” image. Which is fine, but it doesn’t always suit a freelancer. And quite honestly some of the elements I changed have affected my Facebook page. So now I’ve quit, I’m changing them back! It feels quite refreshing to quit writing at Inquisitr. I do have a 90-day option to return without going through the handbook and I know people who still write there. I’m keeping an ear to the ground to see if things change. This is part of the reason I don’t burn bridges. Things may change positively. Until that happens, I’ll stick to where I’m currently writing. I’m going to spend my time a little differently this year. One of my clients has temporarily cut work back (long term, I’m not worried), so I have some spare hours on my hands. I’ll be using that time to fill in the gap that leaving Inquisitr has left. That will mean marketing to new clients again and looking into some of the sites that I’d love to write at and putting in pitches. Plus, I’m going to spend more time here and on my other blogs. I’m making a few changes to this blog, so expect to see them happen over the course of the month. Do you write at Inquisitr? Are you thinking about quitting? Share your story below! I left a comment in your second Inquisitr review, not knowing that you posted this third one. They appear to be in panic mode at the moment, with subtle (though not transparent) attempts to cut payroll, and handbook changes that don’t make an iota of sense. I’m not quitting yet, but I am already looking for alternatives to the Inquisitr, though it’s not like I’ve been putting in as much work as I used to back when times were good. I’ve been reading your reviews on Inquisitr and Blasting News and I found them to be helpful. I’ve applied to both sites (this was before I discovered your website) and got accepted in each. Now, I’m not sure whether to try writing for them and see what happens or look for alternatives. I’m a relatively new freelance writer. What websites, platforms, or marketplaces can you recommend that have the highest ROI for freelance writers and editors? I also decided to quit writing for the Inquisitr after I found out how their payment system actually works. It was tiring and at the same time demotivating. The pay wasn’t stable. And most of the time you just have to rely on luck and hope that you’re one of the first writers to publish the story so you’d get at least 400 hits. I wrote like 15 articles and only got 20+ usd.